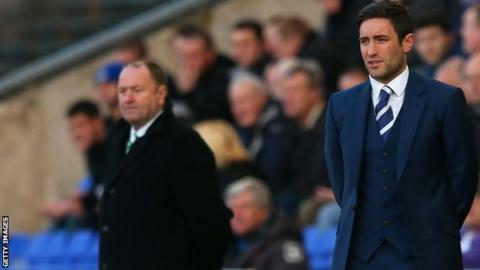 New Bristol City head coach Lee Johnson says he wants to "break free" from his father Gary Johnson's "mould" at the Championship club. The 34-year-old was appointed on a three-and-a-half-year deal on Saturday. Lee spent six years with the Robins as a player, four of them under Gary, who led City to promotion from League One and to the Championship play-off final. "I've always been around it, but you also need your own experience. I do feel I've earned my stripes," said Lee. "As a father, of course, he's very proud, just as I am of him and his achievements. But it's time for me to break free of that Gary Johnson mould at Bristol City and kick on as head coach of this fantastic club." Former Oldham boss Lee joined Bristol City following a one-year spell at Barnsley, who he guided to the Johnstone's Paint Trophy final last Thursday. Gary, now in charge of National League leaders Cheltenham, took his first managerial role in the Football League at Cambridge in 1992, and he has since gone on to spend time with Latvia, Peterborough and Yeovil, where he also managed his son Lee. "When I was about 10 years old I used to hide in the skip when him and John Beck were chucking out their half-time team talks at Cambridge," Lee told BBC Points West. "You learn a lot just from things like that. "He hasn't stopped going on. I stayed at his house last night, watching the analysis from Saturday and I had to keep him out of the way because he kept peering over my shoulder and giving me pointers. "I understand when I was playing here for my dad I could've been a Marmite-type player - I divided fan opinion. But it's completely different now I've stood up to the manager scenario." The Premier League dream is "realistic"
City, promoted as League One champions last May, are currently 20th in the Championship after a 1-0 victory at fellow strugglers Charlton on Saturday. The Robins have never reached the Premier League and have not competed in the top flight since 1980. "The ambition is to continue the progression both on and off the field, develop some of the younger players in the academy, recruit as best we can and, of course, aim for the Premier League," Lee told BBC Radio Bristol. "That's the dream and it's realistic. At the moment there's a short-term plan - we've got to stay in the division - but then we've got to continue to build."